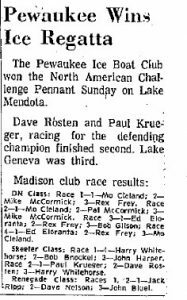 4LIYC’s Dave Rosten and Pewaukee Ice Yacht Club’s Art Jark on Lake Mendota in Class A Skeeters c. 1970. NANCY E III was formerly one of Bill Mattison’s HONEYBUCKET Skeeters. These slides date from around the time of the 1970 Ice Yacht Challenge Pennant. 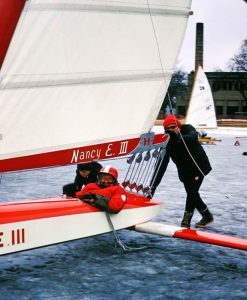 The 4LIYC had won ice yachting’s most prestigious title for 6 straight years but the 1970 challenge was a different story. Read Greg Whitehorse’s account of the 1970 IYCP below the fold. 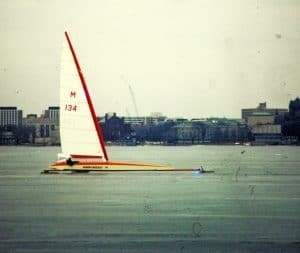 Art Jark sailing NANCY E III Class A Skeeter iceboat on Lake Mendota c.1970. Art purchased one of the HONEYBUCKET Skeeters from Bill Mattison. 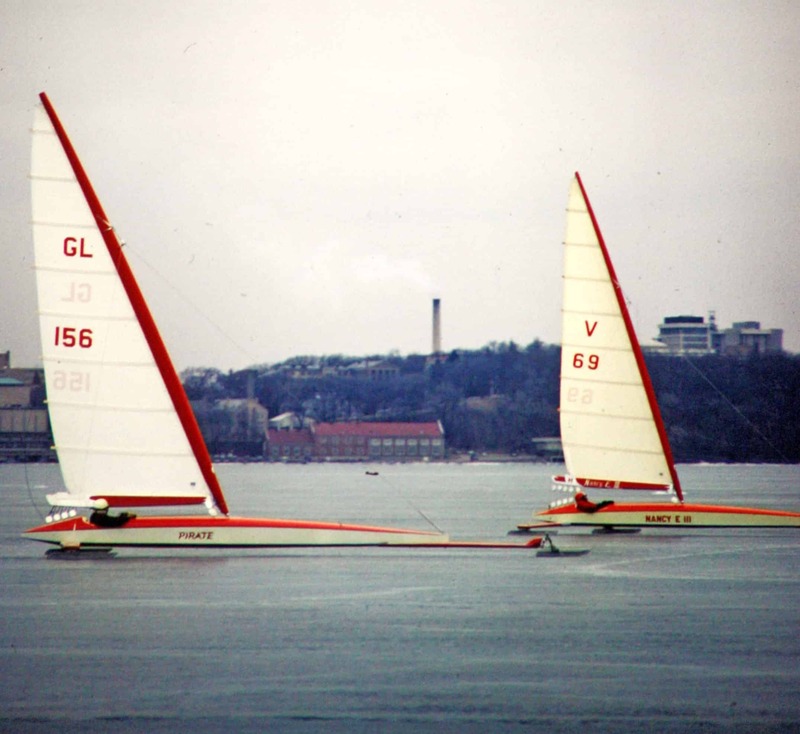 “One of Bill Perrigo’s last great ice yachting triumphs came in the Challenge Pennant races sailed on Lake Mendota in March of 1970. The 4LIYC had won the Pennant in 1964, and successfully defended it for the next five years. Indeed, few thought that the Pennant races of 1970 would produce anything other than a 7th straight 4LIYC victory. But the Pewaukee Ice Yacht Club had different ideas. 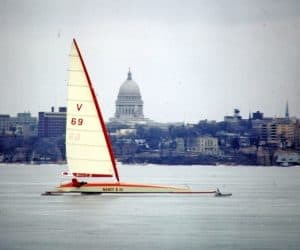 In their bid to wrestle the Pennant away from the 4LIYC, Pewaukee decided to send Art Jark’s lightening fast, ex-Bill Mattison Honeybucket, now named the Nancy E III, to Madison as one of it’s challenging yachts. And Art Jark promptly tapped Bill Perrigo to steer it. The Pennant title came down to the last race of the series that year. 4LIYC’s Dave Rosten, expertly piloting his Skeeter, Pirate, appeared to be headed for victory. But as the long, ten lap, twenty mile race wound down the wind began to pick up. The light snow that had fallen on and off throughout the day began to be blown around at the ice surface. Soon the swirling snow built to almost surreal white-out conditions. All you could see of the boats racing around the course were the top four or five feet of the mast and sail. Finding the marks in these unbelievably dangerous conditions was next to impossible. On the last lap of the race Rosten could not find the top mark. A few minutes later the race scorers and other on-lookers were shocked to see Jark’s V-69, with Bill Perrigo at the helm, streaking toward the finish line. The Ice Yacht Challenge Pennant of America went to Pewaukee. Yeah… under the toughest of conditions Bill Perrigo proved how tough he was.